We haven’t really had a proper Eddie Brock classic Venom in quite some time. It’s not that I even expected one with so many symbiotes to choose from in the Spider-Man universe. I even considered that when the lineup of this wave leaked the inclusion of a McFarlane-era Venom was a tip off that it was fake. It really read more like a “most wanted” list than an actual Marvel Legends wave of figures. I’m glad I was wrong and the list was correct. This is a nice Venom, so let’s check him out! 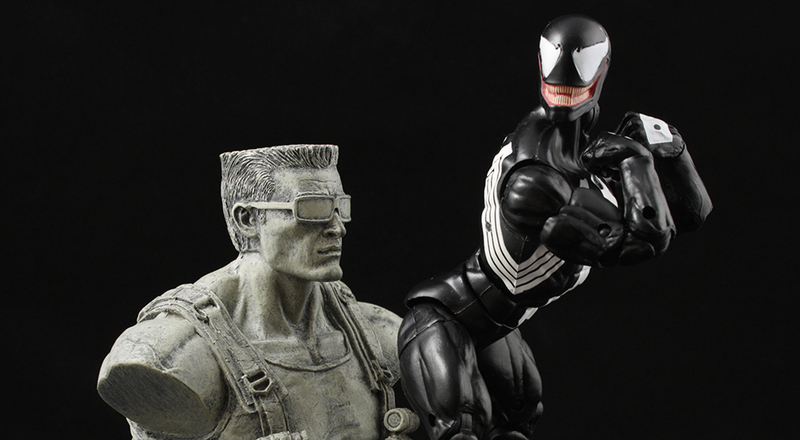 As can be expected, Hasbro opted for the Hyperion body for Venom. It’s a natural fit for this version of the character and sizes him up nicely in comparison to the current Spider-Man mold. While I think the body is appropriate, I also believe it could use some reworking to make it even better. The shoulder balls rest a slightly too low coming off where the shoulders should end. This ends up making most poses where the arms aren’t facing down look unnatural. If they raise the shoulder slightly and maybe put those inward-outward swing joints that come out of the chest it would make this mold amazing. And it really would only require reworking the torso … said the armchair designer. Venom comes packed with an extra head, two fists, and two Absorbing man heads. I mentioned in the Spider-Gwen review how much I like extra hands, so I’m glad he includes a pair of open hands and a pair of fists. I’m very welcoming of the extra hands trend. In this wave alone, four of the seven include optional hands. I appreciate optional heads and hands much more than shoe-horned accessories. One more nit-pick, the head(s) rest a little high on his shoulders. Other than than that I’m very pleased with Venom. He’s no Big Wheel but he’s a classic Spider-Villain, and it’s great to get another one of those Hasbro updates that render a ten year old Toy Biz figure obsolete. The paint has a little slop on the body of mine. They did a good job on the head, especially the alternate head with the tongue out. So overall for a mass retail figure the quality is under decent enough control. With a rate of three to four Spider-Man waves per year I’m interested to see when we hit a Spidey saturation point. Toy Biz used to keep that carrot on the fishing line in front of us with a very staggered villain release schedule. Hasbro gives no fucks and just dropped a wave on us that was 75% villains … and probably one of the best ones yet. We’ve gotten some great Spider-Man variants and side characters. At this point I’m starting to believe The Owl and Overdrive have realistic chances of seeing plastic in the near future. I’m not going to question it now because I’m enjoying it far too much. Maybe a good question for Hasbro is “where do you see this Spider-Man line in five years?” Are there realistic chances of a bag-head Spider-Man or Spider-Ham in Marvel Legends? At the rate we’re getting characters we may have to! Check your usual spots for this wave. If your usual spots aren’t working out you can always Amazon it. Or order a case off of Entertainment Earth. The choice is yours, and yours alone! Hi! Thank you for the wonderful review and funny pics! With the success of spider-verse and the release of web warroirs comics, I am one of those who wants an army of spider-men and women. Yes, that includes Spider-Ham! I’m with bLo0dheaven. I’m all about the Spider-Ham. As for Venom. These are probably the greatest Venom poses ever committed to digitaloid. And I third Spider-Ham, I’d buy him in an instant.